Pretty good week for Artifacts last week. Preview pages for issue #2, introducing Jackie Estacado into the storyline, hit a number of sites. You can find them here, among other places. Artifacts #2 will be in stores this Wednesday, Sept. 29. 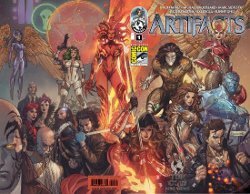 The third printing of Artifacts #1 also hit stores, the first time a Top Cow release has ever gone to a third printing. News also broke revealing the identity of the next artist on the 13-issue Artifacts series. Michael Broussard is drawing issues #1-#4, of course. The next arc, issues #5-#9, will be drawn by Whilce Portacio, probably best know for his work on Uncanny X-Men. Whilce and I had breakfast out in San Diego during the con, and discussed the kind of story we wanted to tell, especially in terms of scope. We’re very much on the same page in terms of wanting to bring an epic scale to the page. It’s going to be a great collaboration. USA Today had the first story, which includes comments from Whilce. You can read it here. I made another appearance on the “Funnybooks with Aron and Paulie” podcast for Ideology of Madness. The interview is pretty loose and wide-ranging, covering a lot of topics, from the recent releases of Magdalena #3 and Angelus #5, to general concerns like accessible comics and even Darwyn Cooke’s recent comments. You can listen to the whole thing, clocking in at more than an hour, here. I really appreciate the support Aron and Paulie have shown the Top Cow publishing line, and my books in specific. Hope you enjoy the interview. Over the weekend, my wife, daughter and mother-in-law completed a local triathlon as a team. Not Ironman length, of course, but still a pretty impressive accomplishment for three generations. Especially so, considering my daughter was the youngest competitor at 9 years old, and my mother-in-law was among the oldest at … well, I don’t want get myself into trouble. Very proud of all three of them. My wife is also doing a charity bike race later this month to raise funds for Habitat for Humanity. The link to the fundraising page is here. So we’re starting up an old school “mailbag” section for the website. You can email your questions to mailbag@ronmarz.com. I can’t guarantee I’ll be able to answer letter that comes through the system, but when I have time, I’ll try to get to some of them. You can view all of the mailbag posts anytime by visiting this link: Mail Marz . I was hoping to get some advice about how to construct panel counts. I’m a writer, not an artist, and I’m always fighting with how many or how few panels to use on any given page. I notice that you tend to stick with 4-5 panels, while Morrison swings from 3-9. Thank you for your time and I would appreciate any advice you could give. Stephen, the best answer as to how many panels to put on a page is: as many as it needs. I know that sounds flippant, but it’s the most appropriate answer. 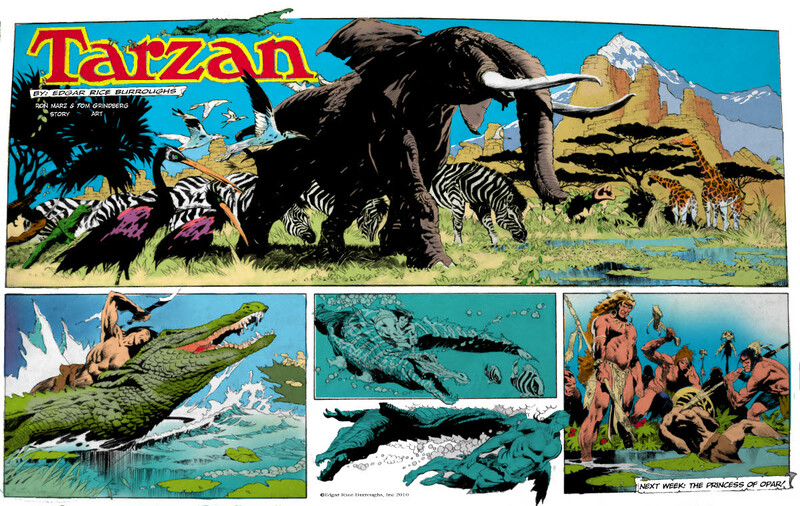 Each page is a unit that must stand on its own; it must have enough necessary information – whether visual or narrative – that it’s worthy of a page. Conversation-based pages will tend to be more dense, while action pages will be less dense in terms of panel count. A lot of artists would tell you that five panels per page is fairly ideal, because that gives the artist the most flexibility in designing the pages. An even number of panels tends to lead to more grid-style layouts, while an odd numbers of panels leads to a more asymmetrical and often creative layout. That’s not to say either is a better option, just different. Sometimes a grid is more effective for that particular page, sometimes something with one large image and a few smaller ones. I use a six-panel or nine-panel grid relatively often, because it’s a very clean storytelling device. Story style can influence panel count as well. 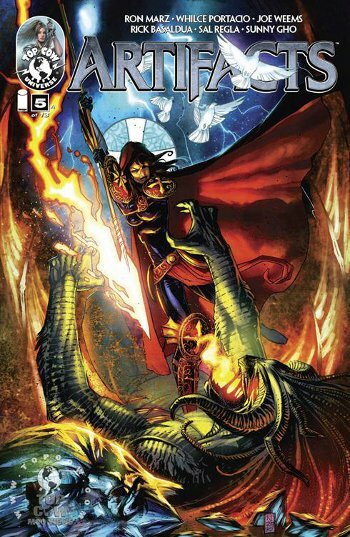 Something like Witchblade is more of a noir-type mystery or crime story, so the panel count is more dense. A traditional superhero story, like Velocity, is likely to be less dense because you’re dealing with splashy images and over-the-top visuals. The artist you’re working with should also influence panel count. 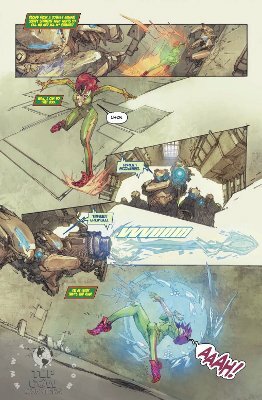 Kenneth Rocafort, for example, has a very design-oriented approach to pages, so I keep the panel count to four or five per page when possible, so he has more room to work. When Mike Choi and I worked on Witchblade, Mike really liked to draw the subtle character stuff, the “acting,” so the panel counts tended to be more dense. As a general rule, for a smaller and more intimate scene, the panel count should be more dense. For a larger and more expansive scene, the panel count should be less dense. 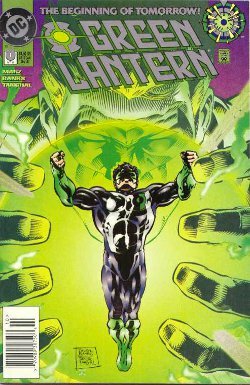 I’ve been reading recently – well, in the span of the last year – all of your run on Green Lantern, and loved it to bits. Not only for the original approach to the mythos and the concept of the ring – that I dig wholeheartedly – but mostly because the way you handle your characters, you really made me feel for them, and that’s something that is not so common in the end. Your characters feel real in a natural way, and I really love how you gave them that human side one can relate to in such an immediate fashion. Reading about Kyle’s life left me with such strong emotions in me I’ll remember it for years to come, and the loves, the hopes, the doubts of this man made me rethink some things of my life too in a moment I needed that. 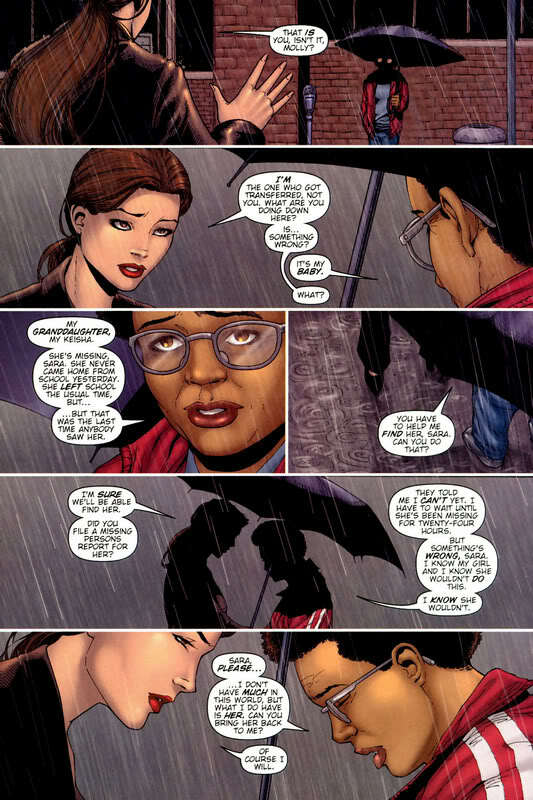 Too shallow, to have some important real-life thoughts triggered by a cape comic…? Who knows, but it happened, and I’m glad it did. Catching up with Witchblade whenever I can. Thanks again for everything. V., I’m truly humbled. Thank you for taking the time to write, as well as letting me run your very personal note on the blog. Artifacts #1 was quite good. Will the art team remain the same on each issue or will each artifact have its “own” art team? After seeing his cover, any chance Dale Keown will be doing any interiors? I’ve enjoyed your writing since GL, but will you still accept the money I spend on your stuff if I watch Fox News and have the occasional conservative opinion? Thanks for picking up Artifacts #1, Jim. Michael Broussard will pencil issues #1-#4 of the series, then “Act Two” (issues #5-#8) will have a new art team, which should be announced in he next week or two. “Act Three” (issues #9-#12) will then have a new art team, with issue #13 in the hands of a very special and very appropriate artist. As for the rest … absolutely! Obviously I’m fairly outspoken and honest in my Twitter feed. 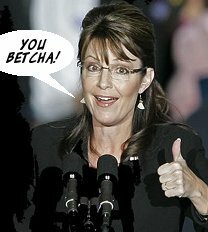 I don’t hide that I’m a pretty liberal fellow, or that I think Sarah Palin is dumb as a stump. There are certainly pros that don’t make such views public, often because they don’t want to risk offending anyone and hurting their own sales. That’s certainly their right. My personal choice is to be as honest as I can be, to not hide who I am or what I think. I also don’t object to anyone else airing their views if they happen to differ from mine. I might disagree with what you say, and even debate you on it, but I will always defend your right to say it. Huge fan of yours and of Top Cow comics in general. I have been picking up (for the past two months) every single back issue of the official Top Cow canon books (Witchblade, Darkness, Cyberforce, Universe, etc.). 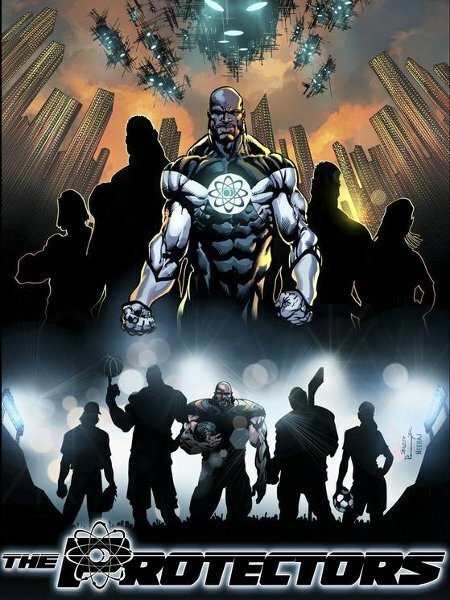 I am doing a mass reading of all of them starting next week, and plan on taking notes of every single issue to make a list of a basic chronological order that the Top Cow universe takes place in. It’s daunting, yes, but it gives me a reason to read all of the back issues of Top Cow all over again. Any tips you could give me? Are there any obscure books that are part of the Top Cow universe that I may not know about? I plan on posting the list when all is said and done. Thank you, sir. Have a wonderful day! Wow, Keith, I envy you having that kind of time! First, thanks for picking up the books; hope you like what you find. Some stray minis/concepts to consider: Aphrodite IX, Arcanum, Necromancer, Weapon X Zero, Strykeforce. I’m not much for slavish attention to continuity, I always feel like what I’m writing should be accessible to new readers and not mired in stories from a decade ago. That said, I’ll be very interested to see what you get out of such a mass reading. Love to hear your conclusions. Here’s an update in the earlier post featuring the Sunday page-style script I wrote for Tom Grindberg. Here’s Tom’s color version of the piece (at least a photo of it, rather than an actual scan). I’d like to slap some words on the page, but with the deadline load I’m supporting right now – barely – it’s going to be a while before I have any free time for something like that. This year’s Baltimore Comic Con was an absolute pleasure, as always. Had a great time, and the reception for me, artist Nelson Blake 2nd and Top Cow was very much appreciated. I signed pretty much non-stop when I was at the table, got to catch up with a bunch of friends, and attended the Harvey Awards. Also got to see my nephew, Leif, and his girlfriend, Rachel, whom I hadn’t seen in about four years (they live in Hawaii, but Rachel is doing an internship on Capitol Hill). Should’ve brought my sunglasses to the interview. Other than that, I really enjoyed it, as Brett asked a number of intriguing questions, covering topics beyond the standard questions about what I’m working on. Hope you like it.